A popular rule out there is the “20-20-20” rule, which states that every 20 minutes, look 20 feet away for 20 seconds. 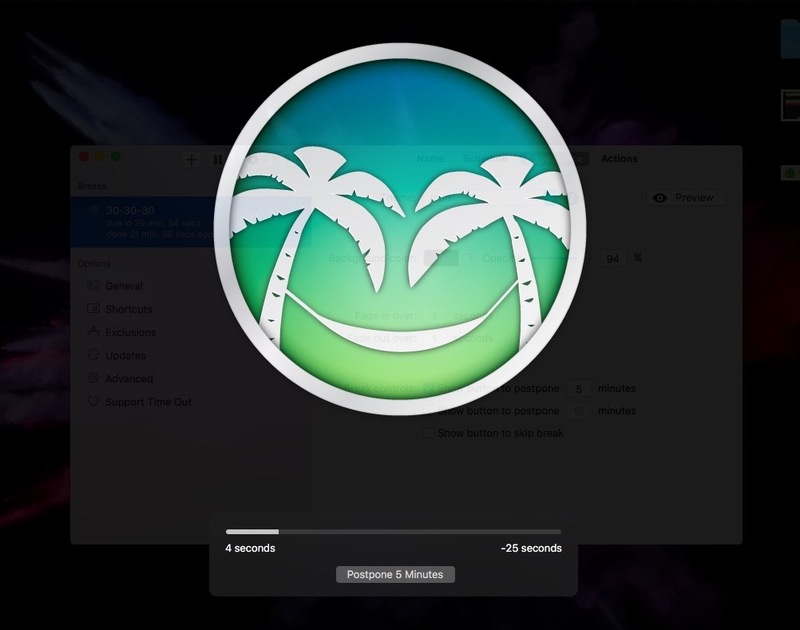 Time Out is a nifty little utility for Mac, which encourages users to take short breaks after a specified amount of time. You can set the default “20-20-20” rule to reduce eye strain or you can go a step further and customize the time between breaks. Time Out is a great tool that helps combat eye strain while working on your Mac. There are a lot of similar apps available, but Time Out manages to do the job perfectly for me. Time Out is available in a free version, but if you want to the app to remember the changes, you will have to support the developer through an in-app purchase of either $2.99 or $4.99 or $9.99. The reason why staring at any desktop/mobile screen is deemed extremely harmful is because it emits blue light. The blue light emitted by the screen reaches deeper into the eye and causes damage to the retina. The blue light can cause all sort of problems like headaches, eye fatigue and even deprive you of sleep. f.lux aims to combat this problem by shifting your screen color to a warmer/yellowish tone. The display may look weird at first but you’ll get used to it after a while. You can adjust the amount of yellowish tint manually. It also allows you to enter your location, so it can automatically enable itself when the sun sets and adjust the tint accordingly. It also has an additional color effect – the darkroom mode. The darkroom mode is a pretty aggressive mode, which turns the screen in a black-and-red shade that is helpful if you’re working late nights. f.lux is available for free and along with macOS, it’s also available for Windows, iOS and Android. Since I spend most of my office days sitting on a chair, I’ve been struggling to maintain my posture. You don’t need to be a doctor to understand the consequences of a bad posture. 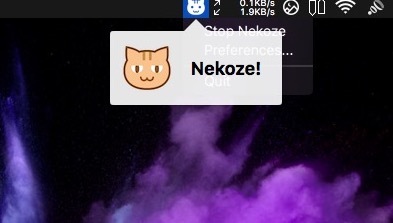 Nekoze is a menu-bar app for Mac that monitors your posture using the MacBook’s iSight camera. The first time you set it up, Nekoze asks you to sit straight, so that it can “calibrate” your ideal posture. Once calibrated, it monitors your posture using the camera and notifies you when you slouch. If you feel like Nekoze is being way too aggressive, there’s an option that allows you to set the frequency. Using Nekoze requires the camera to be turned on all the time. Battery wise, this shouldn’t be a problem for someone who plugs-in his MacBook all the time. But of course, you’ve to be okay with the fact that you are being monitored all the time. Auditory distractions at workplace can be a major problem, considering it really sets back your productivity level. Sometimes, you feel like working away from the crowd – in the woods hearing the birds chirping or by the beach, sipping coke. While Noizio doesn’t magically transport you to such places, it features an extensive list of relaxing sounds. Just plug in your earphones and you can enjoy the sound of sea waves, wind chimes, or the melodious rain, just to name a few. The best part is that you can mix-and-match various sounds, so you can get the feeling that you’re sitting in a coffee house while it rains. Noizio can greatly enhance productivity while you work on your Mac. The Pomodoro technique is a big hit among productivity enthusiasts. The technique encourages you to take short breaks after every 25 minutes. Don’t let the simplicity of this technique fool you – it can greatly add a punch to your productivity. Tomato One is a simple Mac app based on the Pomodoro principle. 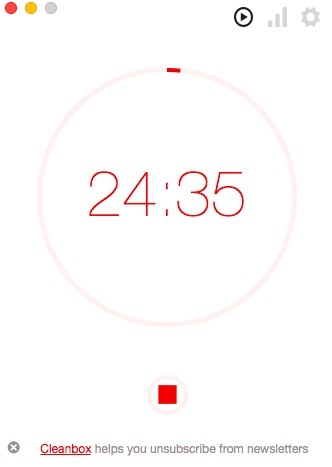 It notifies you to take a break of 5 minutes after every 25 minutes. This entire cycle is called one Pomodoro. You can also do this using the earlier mentioned “Time Out” app, but Tomato One shows your history from the last two weeks, which can motivate you to do more Pomodoros. It is a must-have app to stay focused and healthy on your Mac. The app is available for free but includes ads, however, you can remove them via an in-app purchase of $1.99. These are some of the apps I personally use to stay healthy while I work on my Mac. These tools when used properly have the capability to keep you aware of your computing habits, while also making your productive. That was my list but is there any other app you use to stay healthy while working on your MacBook? Drop me a line in the comments section below.